“Give it back,” Jmal shouted. He flapped one wing irritably and coiled his tail under him, getting ready to pounce at his older brother. Jmal sprang from his perch. He missed his brother’s tail and tumbled towards the snow-covered ground, managing to orient himself in time to avoid crashing into the frozen pond. “Come and get it.” Jred pivoted in mid air and glided along the sloped valley towards the village. Jmal flew after him but the winter chill made his wing blades stiff and he fell behind quickly. Jred was almost one hundred and thirty years older than him, with a wingspan twice the length and back muscles that had all the female dragons swooning when he flew by. Jmal hurried towards the village. He hoped Jred wasn’t angry enough to actually eat his ruby. He would never forgive his brother if that happened. Grandfather gave it to him and it was his to eat. If Jred absorbed the energy from that stone, Jmal would… well, he’d be furious, that’s for sure. And if he couldn’t get it back he’d tell their mother. He didn’t like when the older dragons coddled him like he was still a nestling, but there were times when being considered too young to fend for himself played to his benefit. He was starting to feel a little better, when an ululating howl crested through still air. Jmal landed immediately, and pressed himself close to the ground. He huffed and puffed, and sucked in a deep breath. The sharp, sour taste of fire serum filled his mouth, and he scanned the sky, waiting for the wraiths to show themselves. When nothing happened, Jmal spat the chemicals out, and rose up on his hind legs. He pulled the strings of his wing warmers tighter, and looked around. They were close. But where? He twitched his ears, straining to hear the howls, but they didn’t sound again. Jmal looked up at the sky and groaned. There was no point risking abduction when he was this close to home. The last thing he needed was to have his soul sucked out through his eyeballs and disappear without a trace into the mist. Jmal had heard rumors that the wraiths stalked dragons, chased them into their unusual fog where they feasted on their flesh, eating everything including their bones. He wasn’t sure he believed the tales, but one thing was for certain: gone meant gone for good. He dropped onto his forepaws and continued walking toward the village. A gust of wind tossed snow in his face and Jmal grumbled and quickened his pace, avoiding snow-covered boulders and not-quite-frozen puddles. He could see the reflection of his blue scales rippling in the water. It is a blessing, not a curse. Well, if being followed by endless chanting and groveling from the village elders, and then having to endure the contempt of his nest mates when they were forced to offer him gifts was considered a blessing, then he’d rather be cursed. Who cared if his wings had horned tips or that he glowed at night? Jred had two sets of wings and Mrew didn’t look like she was ever going to get her wings. So why was he any different? He shivered and tucked his tail closer to him. He didn’t think he’d be able to spot the wraiths against the grey sky, but he hadn’t heard any howling in a while now. Jmal stopped and sniffed the air. Frost and leaf litter. No blood, no death. He bent his knees and prepared to spring into the air. What would mother think if you went and got yourself devoured by a wraith? He hesitated and fell over into the snow. Picking himself up, Jmal pointed his snout to the ground and kicked at the snow, grumbling as he continued walking. Jmal hurried past the stone archway and into the village proper, past Center Fountain and onto a road lined with squat houses. He looked to the left, and squinted to the right, wondering why none on the lamps had been lit yet. Jwel, Head Lamplighter, was a proud dragon, and this was most unusual. Jmal hurried through the streets, turning corners automatically and already being able to smell his house. Just as he reached his door his scales began to glow. They lit up the overhang and the bristled mat his mother laid out in front of the door. It also lit up the blood. Green streaks splattered across the wood, and ran down in thin vertical lines. He suddenly realized that none of the houses on this street were lit up. The wind blew through his wing warmer and made him shiver. “Alright, Jred, not funny.” Another gust of wind. “Mrew? Mrow? Mama! Hey, is anyone here?” A low moan floated down the narrow street. It grew louder, reaching a vibrato pitch as dense fog oozed from between the houses. Jmal tucked his wings in and backed up against his door. Two wraiths, grey and translucent, snaked their way towards him. Something wrapped around his neck and pulled. He stumbled through the doorway and down the hall of his house. “Shut the door,” Mrew, his older sister said. He was about to speak when she slapped her tail over his mouth. “Nobody move,” she whispered. The wraiths dragged their long nails down the wood. Fog started to creep in under the door. Their moaning turned into a shriek, and he closed his eyes. When the world fell silent he opened his eyes and looked around. Mrew stood between him and the living room window. His mother was sitting behind the couch with Mrow, his younger sister tucked under her wing. “He’s fine,” his mother said. “Come, everyone, into the basement,” his mother said. Jmal followed her, careful not to bump into anything in the dark. “How did you manage to stop glowing?” Mrow asked once they were in the safety of the basement. Her pink scales shone in the candlelight and she blinked her pearly eyes. Jmal looked down, startled to see he was, in fact, rather dull. “Well, thank the stars you did, otherwise those wraiths would have broken down the door,” Mrew huffed. She twitched her tail irritably and hopped up on the cot where Jred sat, shivering. Jmal noticed he was trying very hard to glare at him, but there was no mistaking his brother’s fear. His wing was bandaged, as was his leg. Mrew patted Jred’s good leg. “How did they get past the barrier at the city gates? I thought they were repelled by fire,” his sister asked. “The lamps weren’t lit when I came through the gates,” Jmal said. “What do you mean they weren’t lit? They’re always lit, third-born,” Jred snarled. Their mother growled and Jmal and Jred muttered apologies. “Maybe we’ve used them up,” Mrow chirped. “That’s stupid. How can we use up lamps?” Mrew retorted. “You can’t possibly be thinking of going out there,” Mrew said. “Yeah, there are monsters out there,” Mrow piped in. “And what if he doesn’t open the door?” his mother asked. “I’m coming too,” Mrew said. “And me!” Mrow said, bouncing in their mother’s lap. “But this is…” Jmal blushed and wrung his hands. A heavy silence fell over the basement. After what seemed like an eternity, although it was probably no longer than a few flickers of the candle, Jmal took a breath, ready to try his case again. He heard his mother sigh and set Mrow down. She walked over, placed her hands on his shoulders and squeezed tight. Jmal had waited years for his mother to let him make a decision without her intervention, but he never realized how much it would hurt to see her, a dragon of respectable age and size, so afraid. “Because!” Jmal shouted. “Because it’s…” Because it’s different, like me, he thought. “Because it’s mine,” he finished, more quietly. “He won’t be able to see very well in the dark with that stupid glowing of his, so I’ll go to watch his back,” Mrew said to nobody in particular, and hopped off the cot. “Then let’s go,” Jmal said and quickly slunk up the stairs before his mother had time to change her mind. The aura from his scales lit up the main floor and cast unwelcome shadows in the corners of the room. Mrew huddled behind him. He could almost feel her heart pounding against his back. “You sure you want to do this?” he asked. “Yes. Now get going,” she hissed, shoving him forward a little. “Oh for heaven’s sake, we’ll be old and gray by the time we get out of here!” Mrew said grabbing the doorknob and wrenched it open. Both of them tumbled onto the mat in a mess of paws and wings. A low moan broke the silence. Jmal and Mrew looked behind them. “Go, Jmal. Go, go, go, go, go!” She shoved him into the alley, pushing him into the darkness as she ran behind him. Jmal unfurled his wings, angling them forward in hopes to scatter some of the( ?snow ) onto the narrow path ahead of him. It was no use, he was running blind. Mrew’s breath was hot on the back of his neck, and he extended the claws on his feet further, hoping to gain a grip on the frozen ground. The moans sounded closer and Jmal’s heart went from a gallop to a frantic sprint. “They’re gaining, they’re gaining!” Mrew shrieked. She gripped his hand and he realized she was falling behind. Jmal skidded to a halt and shoved her in front of him. “I can’t see,” she moaned. “Neither can I. Keep running,” he said. He could hear the wraith’s claws scratching the ground behind them. The end of the alley appeared before them. “Go tell Jnel what happened!” He gave Mrew a final push and stopped running. “What are you doing?” Mrew asked. He was glad she didn’t stop running. Two gray orbs appeared in front of him. He could hear them panting, could almost see the outline of thin, furry paws loping towards him. A pair of eyes started to glow within the grayness. They were the same blue as his scales. Jmal extended his wings and puffed out his chest. The sharp, sour taste of fire serum filled his mouth. He sucked in a breath and waited. The orbs stopped several feet in front of him. The eyes blinked. The panting slowed. The orb to his left twitched. The other one rubbed against his companion. A soft whine filled the air and when one of the orbs looked down Jmal could swear there were ears poking up from the glow. One of them yipped and then both stared at him a moment longer before they floated back down the alley. 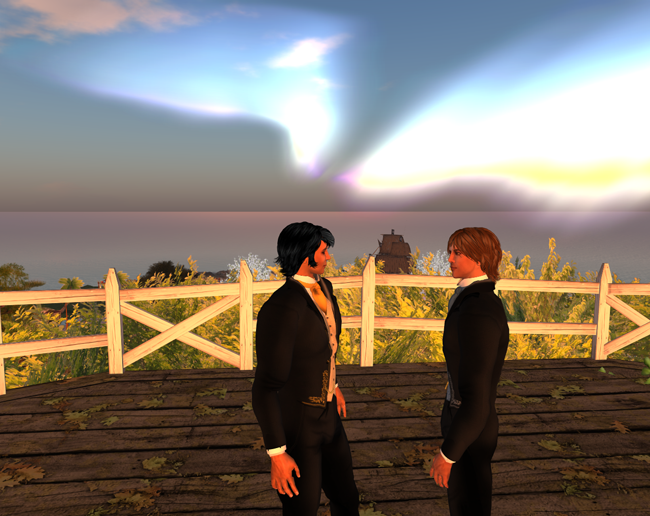 Jmal exhaled in a rush, startling himself when his breath came out in a flash of yellow flame. He stumbled backwards, tripped over some rubble and landed hard on his rump. Groaning, he got back to his feet and looked into the darkness, half expecting the orbs to return, half knowing they would not bother him again. He walked the rest of the way to Jnel’s house, less concerned now when a howl soughed through the night air. The door swung open even before Jmal raised his hand to knock. Jnel, a tall, thin dragon with peeling scales and overlarge eyes grinned broadly at him. “Jmal! Savior of Dragonkind, destroyer of wraiths and tamer of a female’s wild heart. Oh, how delighted I am to see you’re still alive. Come in, come in,” Jnel shuffled out of the way and Jmal slunk into the foyer. He could have happily gone the night without one of Jnel’s outrageous praises. “Neither,” Jmal muttered. Mrew was sitting in the living room, curled on the couch between a heap of tattered blankets and a stack of manuscripts. A single candle sat atop a crooked table to her left. She watched him with frosty indifference, but Jmal did not miss the swollen scales beneath her eyes. “Well, what did they do then? By what Mrew told me, you were done for. So how did you managed to destroy them?” Jnel’s tail quivered slightly as he waited. “They, um, they sort of let me go,” Jmal admitted. “Well, they did,” he added when no one said anything. Jnel blinked and his tail straightened. “They respect you,” he breathed. “They consider you one of their own! You’re their equal! Ha!” Jnel bounced down the hallway and into the living room, crashing into the tower of parchments on the couch and forcing Mrew to scramble off before she was buried beneath scriptures and prophecies. “Maybe my ruby isn’t a ruby,” Jmal said finally. “What else could it be?” Jnel asked. His overlarge eyes fixed on Jmal, and he wasn’t bouncing on his toes for once. Mrew burst out laughing. Jnel giggled uncertainly but a confused look crossed his face. “To go home…” Jnel trailed off and walked to the scattered manuscripts. 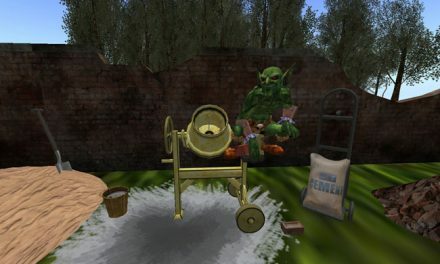 He started digging through the piles, sending one toppling on Mrew and stirring up a whirlwind of parchment. With a triumphant ah-ha! he snatched one of the floating papers. “See? Here… it’s all right here! I never though anything of this picture before, but now, well now it makes sense. See? Look, look!” He laid it flat beside the candle. Several images made a triangle on the page. At the top were the wraiths—or those skinny-legged things with the pointed snout he’d seen earlier tonight—to the right, the elongated tail of the mythical sea creatures known as whales. On the left was a family of scale-less creatures that stood on two legs and wielded spears. And in the middle of this triangle was the symbol of Orco, the first dragon to emerge from the ashes of the Great Demise. The symbol was set in a large red oval, and the longer Jmal looked at it, the more he was certain he’d seen it somewhere before. “Are they lost?” Mrew asked. Jmal started for the door and Mrew bounced off the couch. “You’re not planning on going after them, are you?” she asked. Mrew paled and Jnel started to quiver so violently, scale fell off him like shaved ice. A long, ululating moan rose out of the stillness of the night. Jmal spun around. The two wraiths he’d met in the alley stood in the doorway. Fog crept past them and filled the corners of the little entrance. Mrew uttered a little shriek and Jmal backed away slowly while Jnel ran from the couch to the nook on the other side of the room and back, squawking about death and redemption. The wraiths growled and floated into the room. They came up to Jmal, circled him once, and dipped down in front of him. When they rose, Jmal’s ruby lay at their feet. Jmal picked up the ruby and turned it over in his hand. It glinted in the candlelight and he could see his eyes in the smooth surface. A soft glow emitted from the middle. Without thinking, he stuffed it in his mouth and swallowed. “Jmal! Have you lost your mind?” Mrew screeched. Jmal could feel heat rise from his belly. He hiccoughed, clamped his hands over his mouth, but could not hold back the pressure. He belched a large fireball and gasped when he saw the curtains were on fire. The wraiths yipped and retreated as Jmal hurried to swat the flames out. “I…” Jmal shivered and looked down at himself. 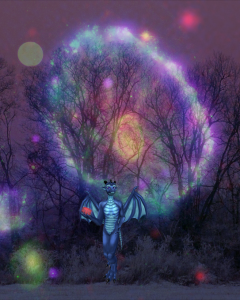 His blue scales had turned purple, and his belly was glowing red. He moaned and fell to his knees. The world tipped and spun around him and he curled up into a ball on the floor. Emptiness began to cleave at his insides. The heat in his belly coiled into a hard, icy fist and he whimpered. Just when he was sure he was going to die, Jmal got up on all fours and with one heave, regurgitated the ruby. Jmal looked over at Mrew. She was peeking out from behind the couch. When he opened his mouth to speak, he emitted a blast of fire and immediately snapped it shut. His next attempt produced the same result. He picked up the gem and watched the light within beat in rhythm with his heart. The wraiths padded over to him. He could see them now, see what really hid beneath the fog and glow. They stood on four long legs, their ears pricked high and forward. Thick white fur covered their bodies, and thinned to a layer of soft velvet that covered their faces and rimmed their yellow eyes One of the creatures licked his whiskered snout, while the other one lowered his head momentarily to sniff the ground. When Jmal didn’t move, they came closer, their paws making sharp clicking noises on the wooden floor. What do you want? he thought, knowing if he opened his mouth he would scorch the creatures to ash. Jmal looked over at Mrew and Jnel, but neither dragon gave any indication they heard the wraiths. He looked back at his ruby. The pulsing light inside it quickened. So take it, he thought, extending the gem towards them. Take it and go home. What do I have to do to help you? Jmal thought. Wouldn’t he die if he did that? Jmal huffed loudly, and exhaled a small fireball. The wraiths yipped and backed away from him. They were lying. They had to be! So why did it take my soul? He thought. …The portals do not discriminate. They grant passage to all earth’s creatures. Jmal moaned. But he didn’t want to go! Jmal held the ruby close to him. What would happen to him when the wraiths went home and took him to wherever it was they were going? Would his spirit sit in limbo like these creatures had? Would he still be a dragon? He looked over at Mrew and Jnel. They’d come out from behind the couch and stood, clutching each other as they stared uncertainly from the wraiths to Jmal. Are there more of you? Jmal thought. He sighed. Being the dragon of legend was a lot of things, but easy had never been one of them. It was a shame heroes were never around long enough to hear the songs written about them. Then again, he would gladly spend an eternity in silence if his family would be safe—yes, even Jred. So all this fear mongering he’d grown up with? And his valiant deed of saving his village from these strange creatures? So why should he even bother, then? Yes, he was different. And that also made him seem weak in the eyes of him kin. Little did they know, though, that that which made him stand apart, was also the thing which made him stand strong. They may not understand it, nor would they like it, but he would never cease being who he was. Jmal nodded. He would take the wraiths home. Jmal walked over to Mrew and wrapped himself around her, wings and all. He then scribbled a few word on a piece of parchment and handed it to Jnel. “You were always meant for something great. Bless you, Jmal, may your travels be safe,” Jnel said, holding the parchment to his breast. Jmal smiled. He was going to miss her the most. Jmal nodded and together they left the house. Once they reached the oak where Jmal had first lost his ruby, he stopped. The wraiths sat quietly to his side. What is your home like? Jmal thought. So, a lot like this world. Are there dragons in this new world, Jmal wondered. …In our world you never die… one wraith said. The other threw his head back and howled. Jmal smiled and extended the ruby towards the wraiths. The stars grew larger, the night sky brightened, and then all three of them began to glow. Agnes’ writing is prolific. Her characters become familiar in a very short time and the story is easy to follow. This is the second short story of hers that I have read and I can’t wait for her first novel to come out.